Open water swimming is a competition against nature. Swimmers must be fit and determined to succeed against rips, waves, bad weather and tides – with only their swimsuit and a layer of grease to protect them. What is open water swimming? Open water swims take place in rivers, lakes or oceans. Swimmers try to cover a particular distance or beat another swimmer’s time. Long-distance swims are up to 10 kilometres long, and marathon swims are more than 10 kilometres. The swimmers need to spend many hours in cold water. They must be fit enough to battle tides, waves and bad weather and they may meet jellyfish and sharks. In long-distance record attempts, swimmers wear only an ordinary swimsuit, cap and goggles. They coat themselves with grease to help keep warm. In the 1700s Hinepoupou, a woman of the Ngāti Kuia tribe, swam from Kapiti Island across Cook Strait to an island in the Marlborough Sounds. It took her three days and a dolphin called Kahurangi swam with her. In 1831 Whakarua-tapu of the Ngāi Tahu tribe was a prisoner on a canoe. As the canoe neared the North Island he escaped by jumping overboard and swam back to the South Island. 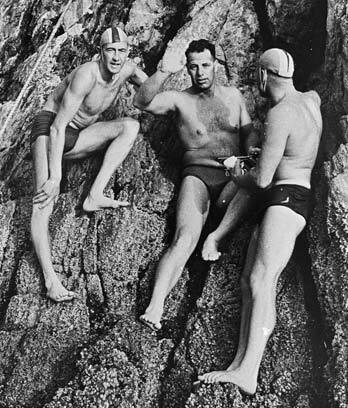 Long-distance and marathon swimming was especially popular in New Zealand from the 1960s to the 1980s. New Zealand’s three main marathon courses are Cook Strait, Foveaux Strait and Lake Taupō. Cook Strait is between the North and South islands and is 22.5 kilometres across. The first modern-day swimmers tried to cross the strait in 1929. Barrie Devenport was the first person to successfully swim the strait, on 20 November 1962. Foveaux Strait is between the South Island and Stewart Island and is 25.7 kilometres across. John van Leeuwen was the first person to swim it, making his crossing on 7 February 1963. Lake Taupō, in the North Island, is 40.2 kilometres across. It was first swum by Margaret Sweeney on 30 January 1955.